Following a year’s worth of undergraduate education in Animal Behavior, Ecology, and Conservation, I have embarked on yet another intellectual journey, resulting in my third and hopefully final blog relocation. Please head to “Animal in the Mirror" to read my new writing on humankind's relationship with nonhuman animals, and our denial of our animal nature. Illustration by Thomas Finley depicting the form of animal which has been proposed to be the inspiration for reports of mystery bat-like animals in Africa and the Americas. Although it is common knowledge among serious cryptozoological researchers that such images are mere hoaxes, photographs alleging to portray the bodies of relict pterosaurs surrounded by soldiers or hunters have been circulating on the Internet once again. These images often come in compilations such as the one which was featured on the They Live Among Us Facebook page. As it appears that my leaving of comments has still not helped to hinder such innocent misinformation, I thought that it would be best to formally address these photographs here. A highly misinformed, spurious image compilation from the They Live Among Us page on Facebook. Another alleged photograph of a freshly killed pterosaur is that which shows the 'specimen' tied to a wall and surrounded by hunters. This arrangement appears to be a deliberate mockup of the notoriously lost 'Thunderbird photograph'. The backstory of this apparently missing image is that several researchers and journalists claimed to have seen the same enigmatic photograph, showing a large form of unknown bird surrounded by men wearing 'cowboy clothing', in the 1950s or early 1960s.2 There has been a degree of uncertainty as to whether the 'animal' looked like a vulture or a pterosaur and as to whether it was nailed to a wall or laying on the ground, as alleged witnesses have varied in recounting this.2 Biologist Ivan Sanderson supposedly possessed a photostat copy which was lost while on loan to other researchers, and no one has been able to locate another print of the image after this mishap.2 Dale Drinnon thinks that he may have identified the image as a hoaxed photostat which used a photograph showing outlaw John Sontag's death as a basis.2 While Dale's proposition certainly is interesting, the probability remains that the clashing recountings of the photograph's appearance suggest it to have been the product of misremembering. While the 'specimen' mentioned at the start of this segment does bear a resemblance to the pterosaur species Pterodactylus, further examination on my behalf has shown this resemblance to be its great betrayer. In discussion of the photograph, Four Corners cryptozoological researcher Jc Johnson has pointed out that the image shows what appears to be deer legs hanging next to the men. Thus, it is likely that this image is photoshopped with the creator having replaced the deer with the alleged pterosaur but missed a few of the discreet features. Upon seeing the image, I thought that the 'pterosaur' looked rather familiar. 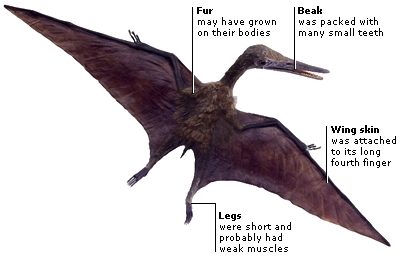 I searched for Pterodactylus models on the Internet and, sure enough, found a match from the DK images website (image of the referenced model is reproduced below). Another case solved and more basis to state that proposing these faux photographs as being related to already problematic claims of relict pterosaurs is highly spurious and unwarranted. The impressive skull of a male hammerhead bat; are such animals fodder for reports of membrane-winged mystery animals? Naish, Darren. "Pterosaurs Alive In, Like, the Modern Day!" Tetrapod Zoology. N.p., 23 Dec. 2007. Web. 21 June 2013. http://scienceblogs.com/tetrapodzoology/2007/12/23/pterosaurs-alive/. Heuvelmans, Bernard. On the Track of Unknown Animals. New York: Hill and Wang, 1965. Print. 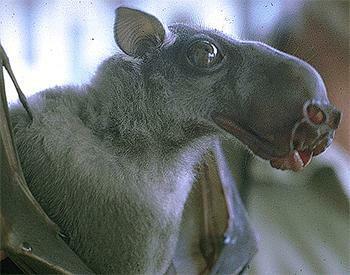 "Descriptions and Articles about the Hammerhead Bat (Hypsignathus Monstrosus) - Encyclopedia of Life." Encyclopedia of Life. N.p., n.d. Web. 21 June 2014. http://eol.org/pages/327349/details#morphology. Regal, Brian. "The Jersey Devil: The Real Story." The Committee for Skeptical Inquiry. N.p., n.d. Web. 21 June 2014. http://www.csicop.org/si/show/the_jersey_devil_the_real_story. Great to see that you discovered the original picture source, namely the DK Pterodactylus, for the supposed thunderbird in the 8-hunters-plus-thunderbird photo! Another hoax conclusively solved. Thanks Dr. Shuker, I appreciate your commentary. Another desperate attempt ro rescue a failed multi-million year extinction for dinosaurs. There has been an unbroken history of humans living with dinosaurs worldwide since prehistoric times. An attempt to refute a photo here and a story there does not succeed in wiping out a wealth of eyewitness and historical accounts of humans interacting with dinosaurs of various desctriptions that continues to this day. ...like the "eyewitness" and "historical accounts" of humans interacting with fire-breathing dragons, griffins (eagle-headed lions with wings), unicorns and flying horses...? OK. So one of those 5 pteranodon photos is a fake. What about the other ones? Not to be rude, but there are other pictures from the civil war. And there are very old legends of "thunderbirds". 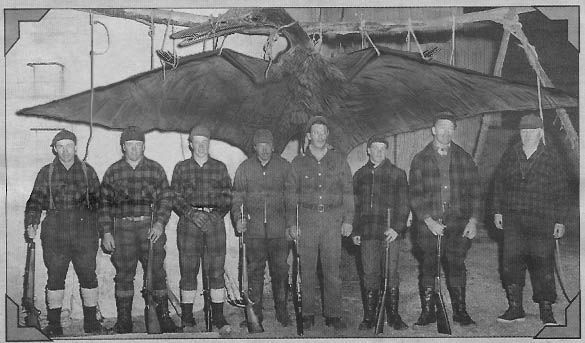 In 2002 there was a 14-meter long wingspanded "bird" reported in alaska. In 1977, there was an account of a little boy who was carried 40 ft. into the air and then dropped by one of these giant birds. In your article you say this is misidentification of eagles. Eagles don't have 14-meter-long wingspans, and neither do giant african bats. There is no known living bid or bat that covers that kind of wingspan or description give in the accounts other than pterosaurs. The accounts given by hunters say the skin of the birds was leathery, and the head looked like an alligators'. Some piolates of airplanes have also claimed to see them.I'm sure SOME of the evidence is hoax, and I appreciate your trying to tell the truth, but there is simply too many accounts and too much evidence for the existence of modern pterodactyls to refute with things like misidentification and things like that.